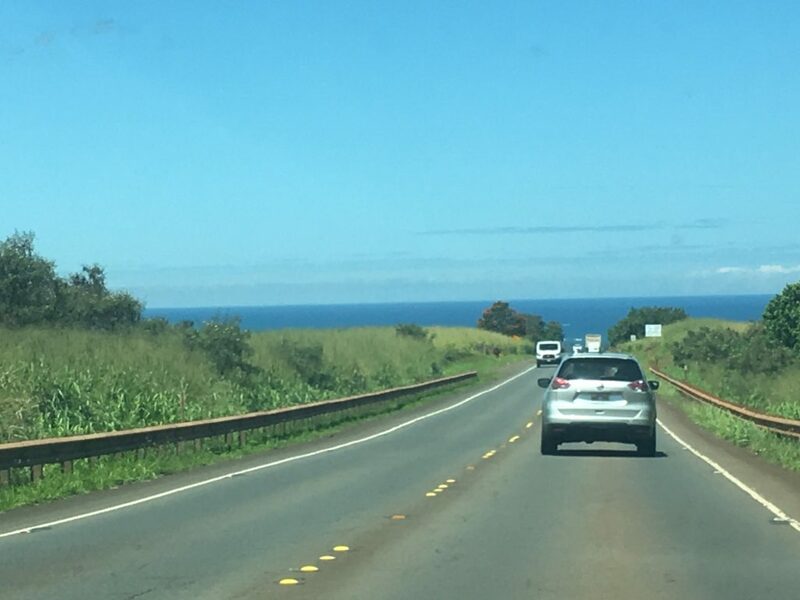 Driving towards Haleiwa, Hawaii, on the North Shore. 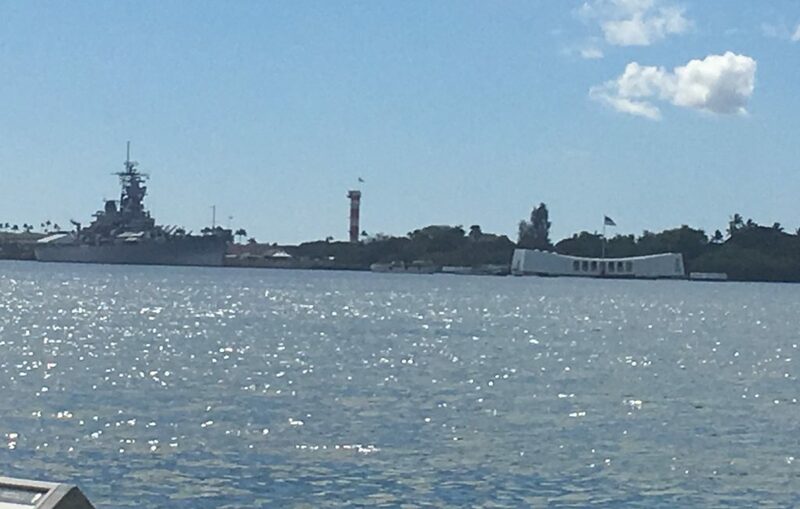 On Thursday we picked up a rental car at about 7:30am and headed straight over to the USS Arizona memorial to see about getting tickets for the same day. We got ourselves tickets for the last boat ride at 3pm, and took a drive around the island in the intervening time. Our first destination was over to Waianae to show the kids where I used to live. The numbers of homeless and abandoned cars — many of which were lived in — were pretty saddening. Our attempt to drive into the naval installation was stopped by the gate guard (“Sorry folks, park’s closed”) who said you had to have official business on the installation to enter. 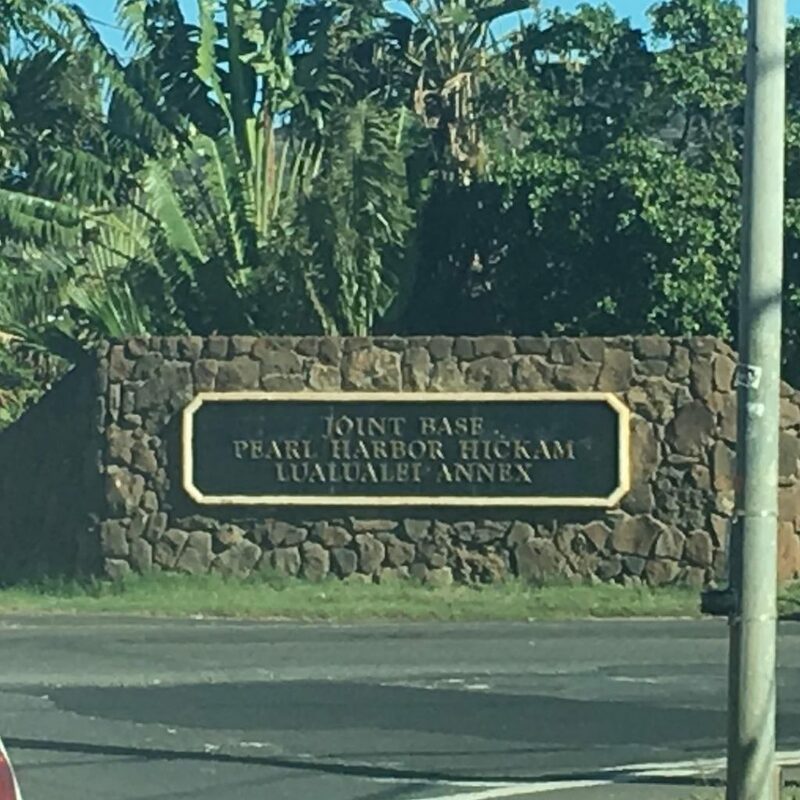 This is now the sign that sits at the corner of Farrington Highway and Lualualei Naval Road. The McDonald’s I remember near this intersection is still here. We even picked up some breakfast food there. 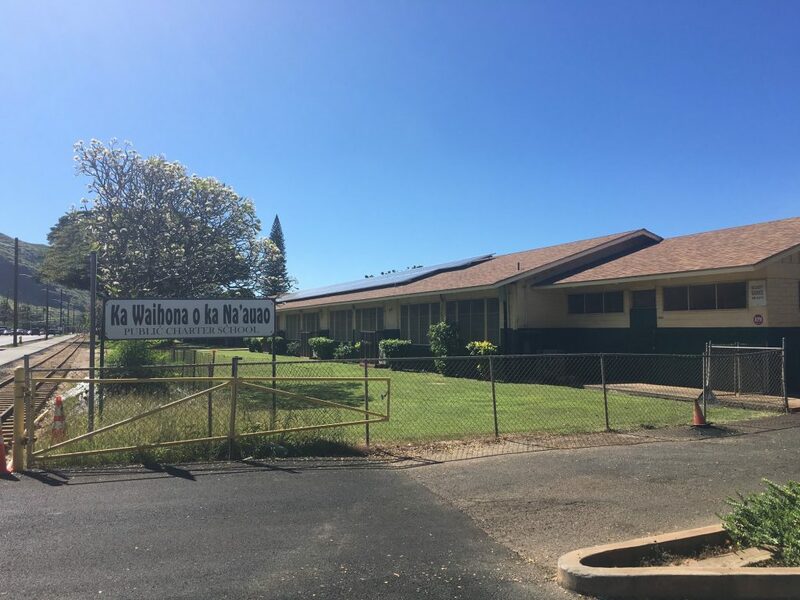 This used to be Nanaikapono Elementary School when I was here between 1978-1980. Nanaikapono moved across the street and now this series of buildings, right on the beach, is a charter school. We continued up the coast to Makaha Beach, then turned around and headed back towards Barber’s Point and Waipahu to turn north towards Mililani, Wahiawa, and Haleiwa on the North Shore. We stopped at a small coffee plantation visitor’s center, and the Dole Plantation. 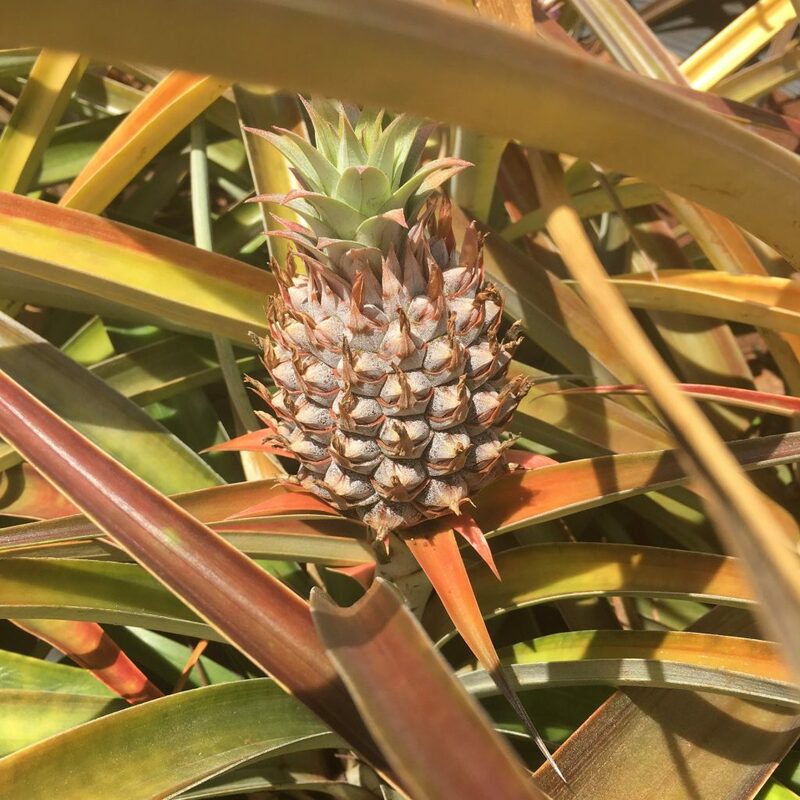 Pineapple! Since visiting the Dole Plantation was more of a “drive-by”, we just walked around the front gardens and the gift shop. 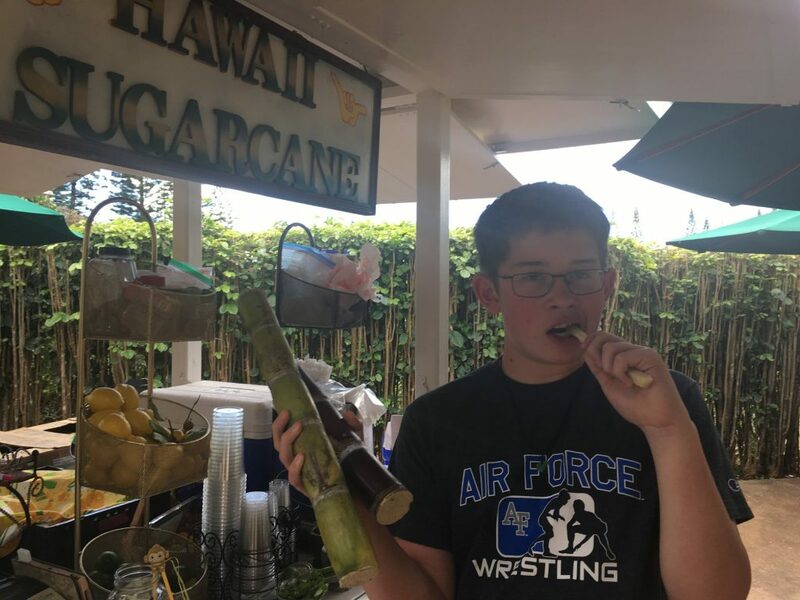 Timmy, ever the foodie, expressed interest in trying some raw sugarcane. Of course it tastes delicious, but he didn’t enjoy the fibrous stalks and ultimately didn’t finish the little piece that he had. 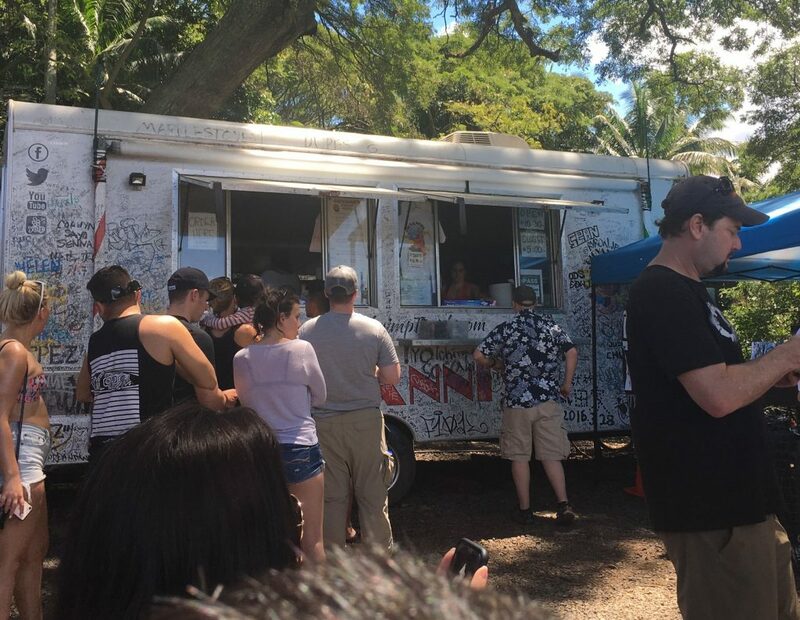 It was lunchtime by the time we got to Haleiwa, and we had numerous recommendations to visit Giovanni’s Shrimp Truck for lunch. We got there right at the start of the lunch rush, so we didn’t have to wait quite as long as the tourists who arrived within minutes after us. Giovanni’s Shrimp Truck. Dave, in the blue Hawaiian shirt, is picking up our lunches on the right after about a 20 minute wait. The line you see to the left is extending about 100 feet off to the left, with about 30-40 people. We got there early enough there were only 4-5 parties in front of us. 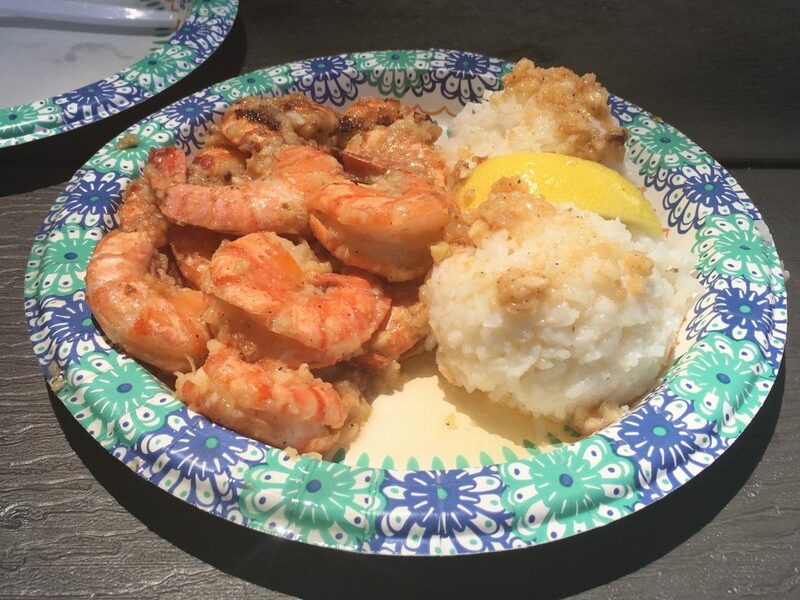 This is the classic garlic shrimp plate. It was very good, and you cant beat the price! A must-see activity when visiting Oahu! Be sure to do some pre-planning for this! If nothing else, be sure to work this visit into your trip to Oahu. However, this isn’t something you can simply drop in to see. Do a little planning. 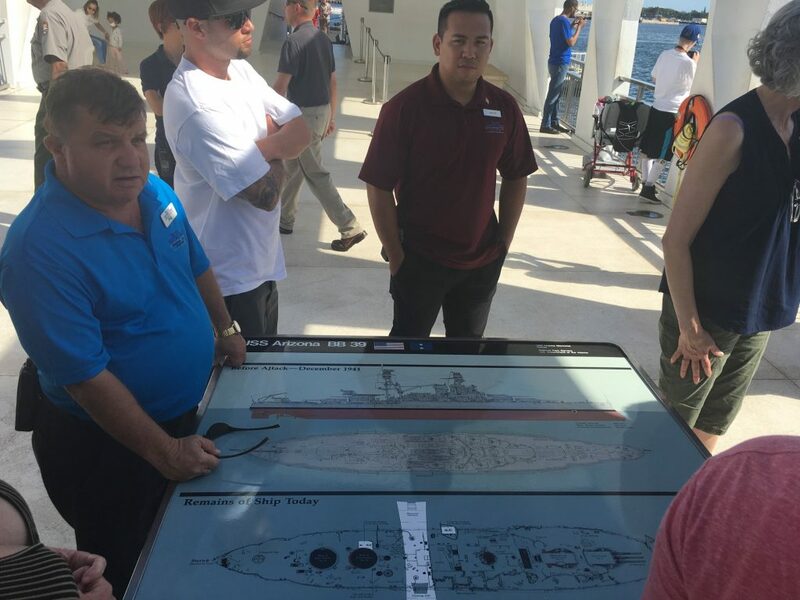 You need tickets for the boat ride to the memorial itself. Either visit the website ~30 days in advance for tickets, or get to the site as early as possible for same-day or next day tickets. You can also do this over the phone or on the website, but our family chose to visit in person for our tickets. We arrived at 8am on a Thursday and the earliest same-day tickets available were at 1:15pm, so we took 3pm tickets for the last boat ride of the day so we could visit the north shore in the intervening time. There is quite a bit to see without the tickets, though. There is a lovely museum exhibit, which I feel does a good job delicately balancing the need for America to enter World War II with the impacts on the families of the native Hawaiians and Japanese-Americans. There’s also a very nice bookstore/souvenir shop. Waiting for the boat to take us to the USS Arizona Memorial. 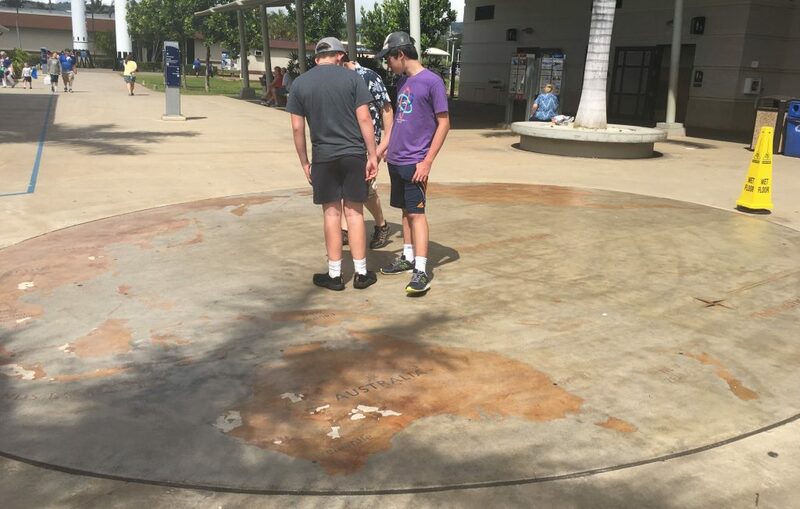 Dave loves history, and here hes telling the boys about the WWII Pacific battles. Phil (on the left) told a wonderful story of Petty Officer 1st Class Joseph George, who had been restricted to the ship, awaiting a summary court martial, hours before the Pearl Harbor attack. He then went on to save 6 sailors on the USS Arizona from his location on the USS Vestal moored adjacent. Click the link to read more about the fight those 6 sailors (and their surviving families) have gone through to earn Petty Officer George recognition for his heroism. I hope Jacob and Timmy now have a better understanding of that well-known day in U.S. history. The museum on-site does a nice job balancing the military events with the impacts on the civilian population on the island: Hawaii was essentially in a state of martial law from the end of 1941 through 1944. 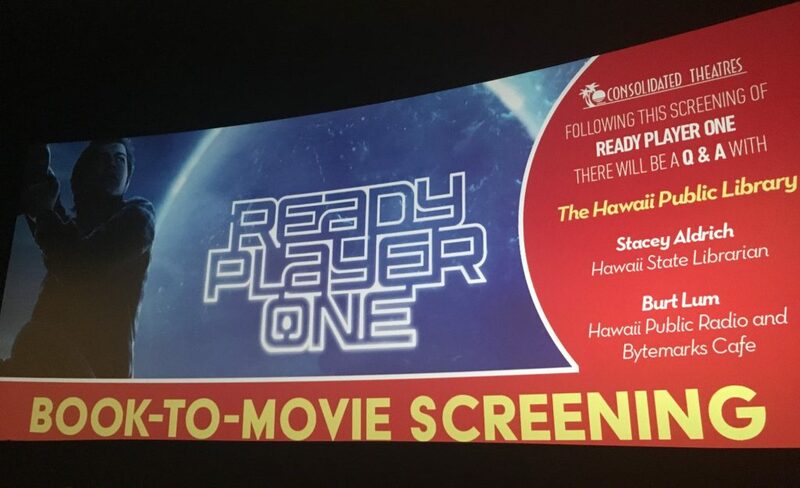 We had dinner at Ala Moana Mall’s food court, and then saw Ready Player One on opening night. Fun movie, and yes, there are numerous deviations from the book. Two historian/librarian types spoke to the audience after to movie to discuss the differences with the book. The kids enjoyed that. We didn’t get back to our hotel till 11pm. 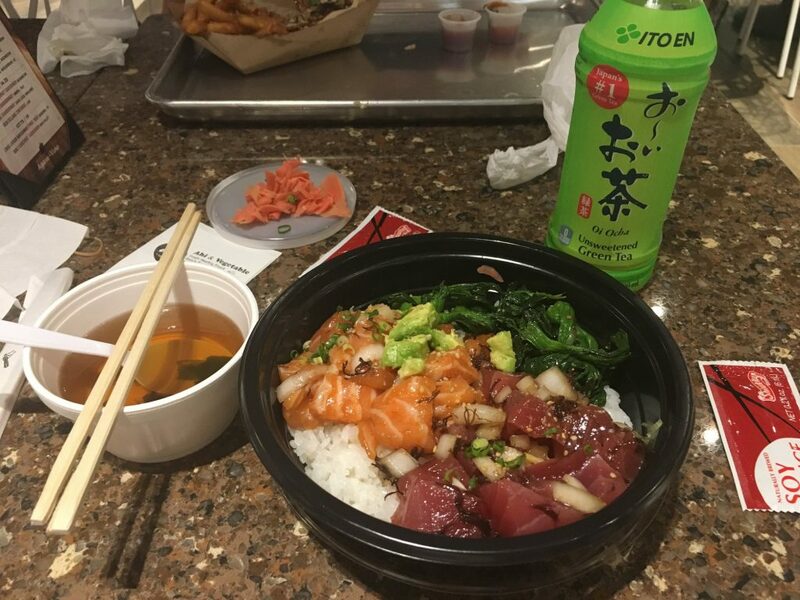 Salmon and tuna poke at the Japanese food court at the Ala Moana Mall in Honolulu. I could eat this all day! There was a discussion after the movie that was fun, but actually pretty brief because it was nearly 11pm.